Billy Sherwood is currently a high profile figure in the progressive rock world, Chris Squire himself asking him to deputise on bass whilst the great man was receiving treatment for his last illness. Now that Chris has passed, Billy continues to help keep the Yes flame burning. Sherwood had worked with Squire for many years from the late ’80s, the two coming together to form the Conspiracy project in 2000 and releasing two albums. It would be fair to suggest that Billy is probably better known for his short time in Yes (around the time of the Open Your Eyes and The Ladder albums) and his work as a producer than for his solo work. His career started in the band Lodgic and then World Trade, neither of which I am familiar with. He originally joined Yes as a touring member for the Talk tour in 1994, before joining full time between 1997 and 2000. He also recorded six albums with the CIRCA, which he formed with ex Yes-man Tony Kaye. 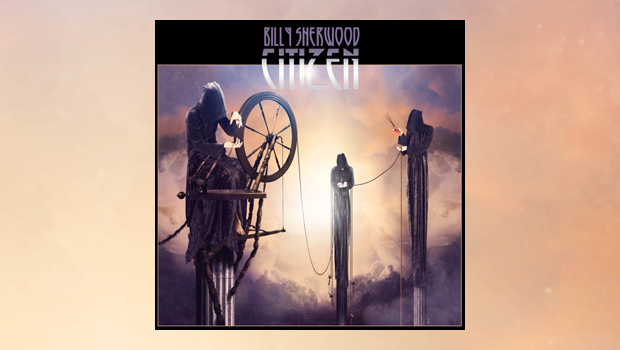 His eighth studio release, Citizen is Billy Sherwood’s new concept album, the theme being “a lost soul reincarnated into various periods of history, he is the citizen…”. The eleven songs here describe the individual experiences through the citizen’s eyes, including as a Roman legionnaire, a trench runner in World War One, a friend of Galileo and a distraught Wall Street businessman amongst others. For this album Billy has invited an impressive array of guest stars to contribute and we get to hear Chris Squire, Tony Kaye, Steve Hackett, Geoff Downes, Steve Morse, Alan Parsons, Rick Wakeman, Patrick Moraz and Jon Davison among them. I must confess that it was the line-up of guest musicians that encouraged me to give this album a try, and this is the problem for me as outside some of the individual contributions it all left me a little disappointed. But I will expand on this later. Citizen is very much, except for the guest appearances, a one man show; Billy takes centre stage and plays most of the instruments – guitar, bass, keyboards and drums. He also handles the vocals on all but three tracks, the others being sung by Alan Parsons, Colin Moulding and Jon Davison. The issue is partly that it all sounds a bit clinical and constructed, lacking that band feel. I know many artists have released multi-instrumental albums that have worked, but here it does not sit together well for me and I am unable to put my finger on why. Production maybe? Considering that this is a concept album concerning an individual’s reincarnation throughout the ages, the tracks are set out in a random way which doesn’t follow the time sequence involved and this appears odd. We have, for example, songs regarding World War One and the Great Depression followed by one about a Roman soldier at the end of Empire. Opening track The Citizen sets the scene for the album and contains what must be the late, great Chris Squire’s last contribution to the music world he so loved. It is because of this, rather than the song itself, that it is an emotional listen for me, Chris’ bass playing is immense and holds your attention. The majority of tracks here have a progressive rock/pop feel, the focus on slow paced, accessible music. It lacks the dynamics that I like in my music but if that is not your preference then there is probably a lot to enjoy here. The Great Depression, the longest track on the album, sees Rick Wakeman giving one of those piano performances that only he can, lifting proceedings and tying the track together well. Man and the Machine features Steve Hackett’s guitar, not that you would know it as he seems to be buried in a somewhat bass heavy mix. It is good to hear from Patrick Moraz with a great keyboard solo on Trail of Tears and the closing track Written in the Centuries is slightly more epic in scale, clocking in at over seven minutes with vocal duties taken up by Jon Davison of Yes. Overall this album did not really appeal to me, and that makes it difficult to give any form of recommendation on its behalf. I think that it may have been the download copy which seemed a bit flat, it isn’t my preferred format and I do not have the best set up to listen this way, so this probably did not help. I am sure that the album might sound better on other formats. I would venture to suggest that if you are considering a purchase of this album that you attempt to find an online stream and give it a listen before parting with your hard earned cash. I understand that,luckily, music appeals in different ways to different people, it would be boring if we all liked the same stuff, and we reviewers would be unable to start any of those musical debates we love so much. Citizen might work for you but it just was not my cup of tea.